"Better Photos By Using Daytime Flash"
Apologies for being late - the holiday season and the Olympics have got me out of kilter! 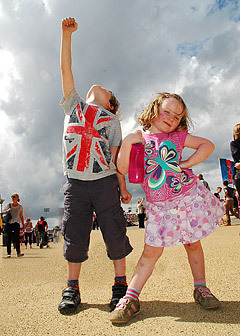 It's summer, and recently I was lucky enough to spend the day at the Olympic Park with the family. We had a great day out and took lots of photos. As I was snapping away I instinctively turned the flash on. Why? Especially in broad daylight? Cameras try to average the light in a scene. They assume that everything is mid-grey in brightness. Consequently, when faced with a bright scene they tend to underexpose the foreground to compensate for the bright background. Thus maintaining a brightness of mid-grey. The problem is that the foreground (in this case, the photo of my two little ones), comes out underexposed. By turning on the flash you can "fill in" some light to the foreground, without sacrificing the background - the flash will never reach the background. The result is the photo above - a bright background, and a bright cheery foreground. Want more proof that flash in daytime works? Watch a wedding photographer at work, the flash is almost never turned off. Hope this little tip helps. Give it a try and you might be amazed at just how good daylight photos can be. See you next month, and if you haven't yet done so, check out my facebook page!